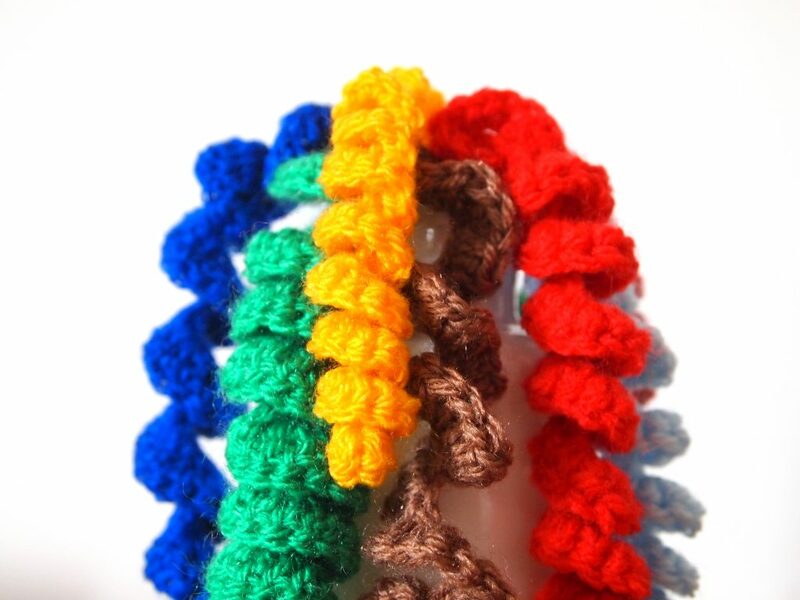 Crochet corkscrew spirals are a great way to add definition to your items. They make cool legs for toys and fabulous hair for dolls. 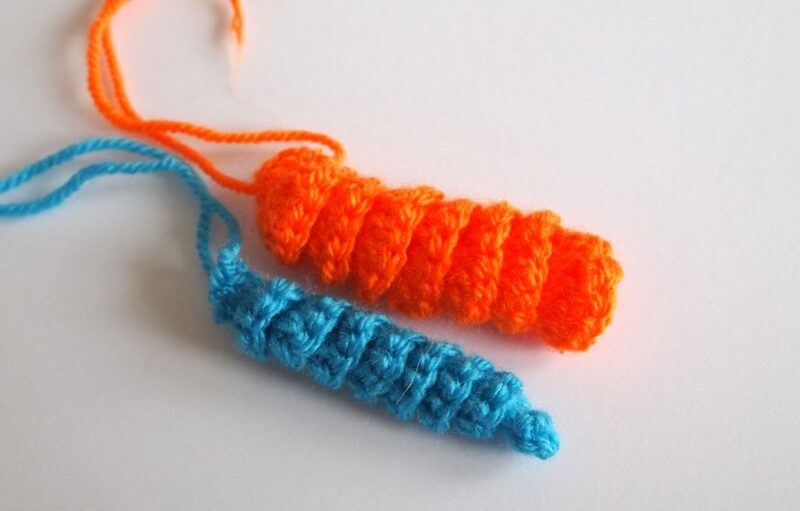 Although they look complicated, they are super easy to make. Below is a quick easy to follow spiral guide. Spirals can be made any length you want. Take note, that the longer the spiral, the heavier it will be and naturally pull the spiral down. Short spirals keep their shape much better. It is advisable to work a tester spiral. Work a chain taking note of how many stitches are in the chain. Work the sequence for the stitch (you can see the sequence in the tutorial below) you have chosen and then measure your spiral. It is easier if you work your tester in multiples of 10 so it easy to calculate. Let’s say, you work a tester with 20 stitches and it measures 4 inches. That means each 10 stitches will be roughly 2 inches. If you want a finished spiral to measure 12 inches, do a simple calculation. Divide 12 (the chosen length) by 2 (10 stitch length). That leaves you with 6, so you need to work 6 lots of 10 stitches. You therefore need to start with a chain of 60. You will also need to add on the initial stitch length depending on the stitch you are working with. 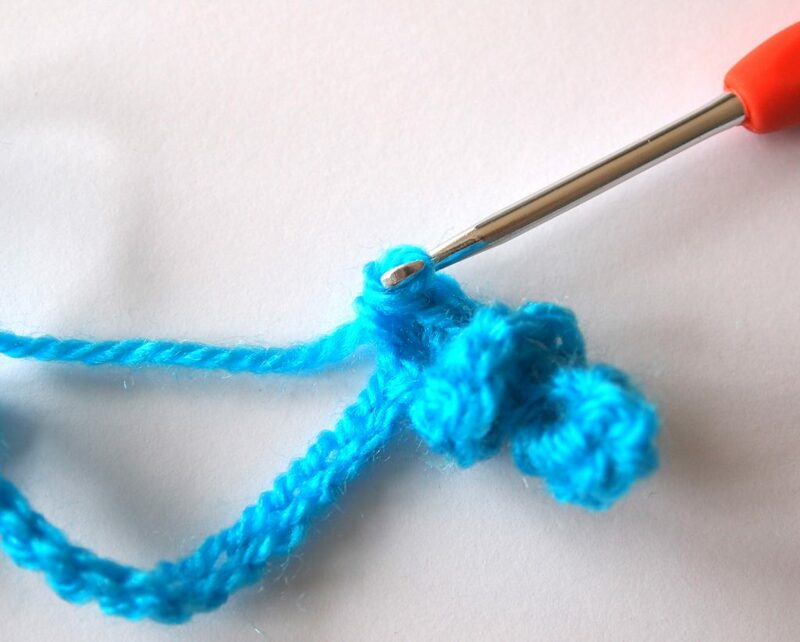 Add an extra stitch for double crochet and add 3 extra if you are using trebles. 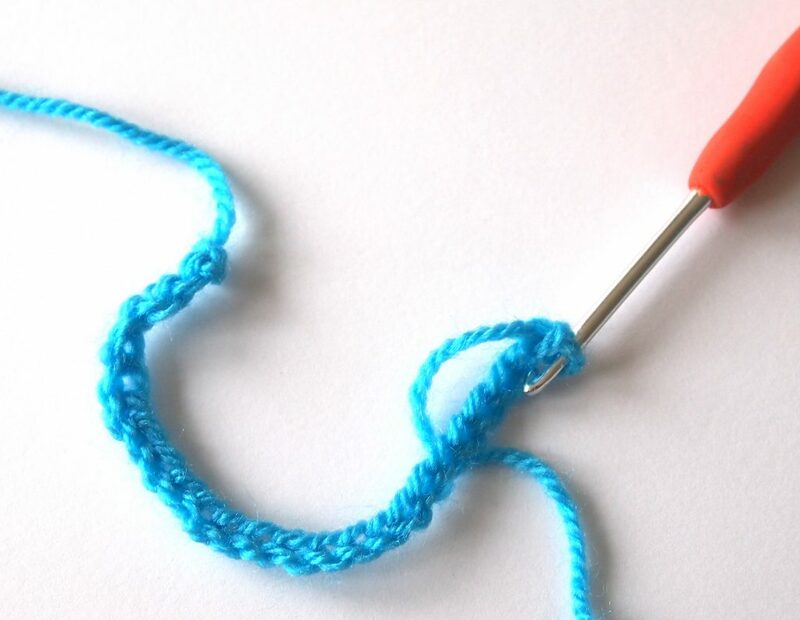 Using your chosen wool and hook, work a slip stitch to start. 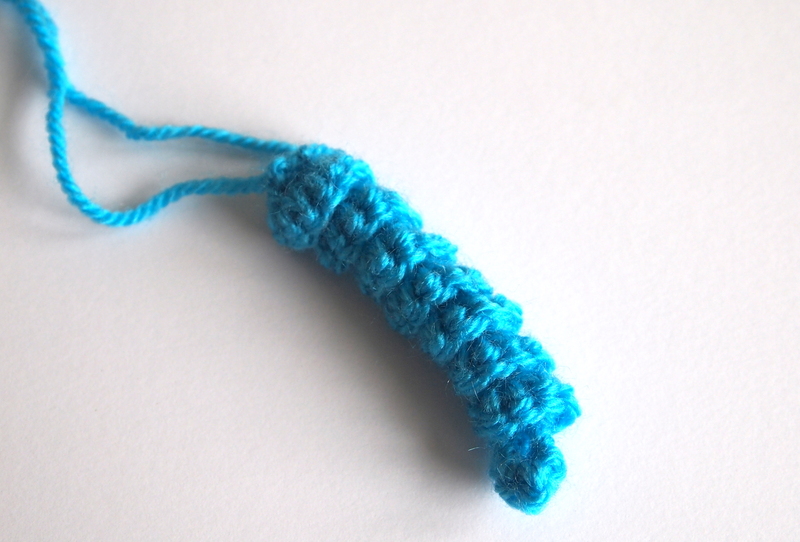 Make a chain to your chosen length, plus the allowance for stitch you are working in. For this spiral we are working in UK double crochets. Miss the 1st chain from the hook and work a dc into the 2nd chain. By missing the first, it creates our 1st dc of the spiral. This means we have now worked 2dc’s. Work one more dc into the same space. You will now have a total of 3 dc in this first stitch. When working in UK dc, you only need to work 3 dc into each stitch back along the chain. This will give you a narrow spiral, it will be nice and curly. Continue back along the chain, working 3 dc into each st of the chain. It really doesn’t matter if you work in the top of the stitch. It will make it look fairly holey, but this will be disguised once the spiral starts to form. Three stitches have been worked, each with 3dc in each stitch. You can see that a spiral is already forming. 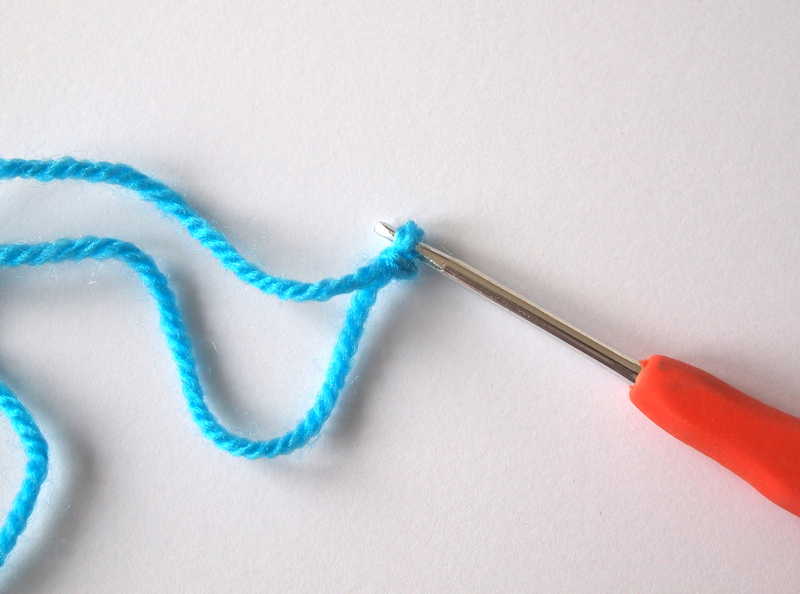 Continue the stitch sequence along the chain until you reach the end. You can work right in the end stitch if you want. It is the sl st you created at the start of the chain. You could if you prefer, choose not to work a stitch here. There is no right or wrong, it is a personal choice. You will see in the picture below that we have worked all the way along the chain. Once you have worked your last stitch, cut the wool and pull through to secure. Sometimes the spiral has a mind of it’s own and starts curling the wrong way. That isn’t a problem, as you simply tease the stitches back into a spiral. You can change the look of the spiral by using different stitches and increases. The one we have just created was using UK dc stitches, working 3 dc into each stitch along the chain. 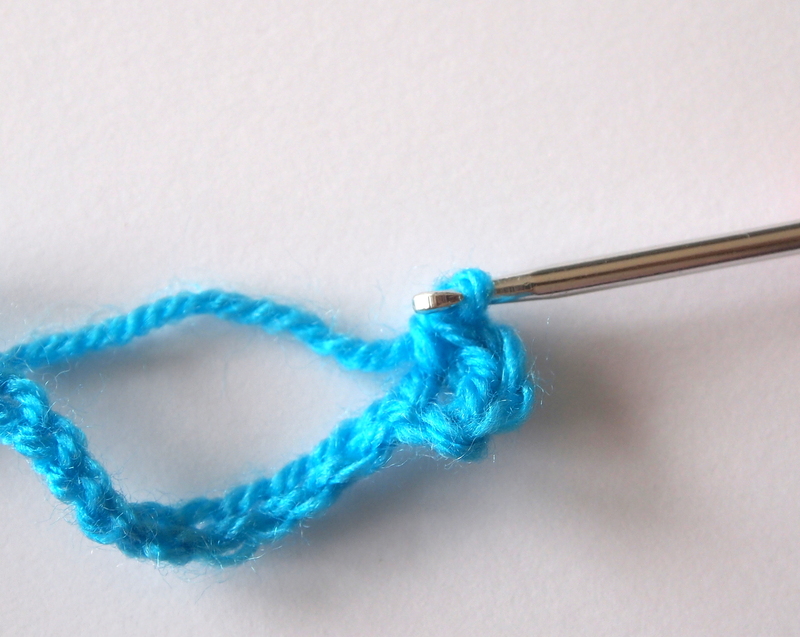 If you want a wider spiral, work a taller stitch. UK htr’s or tr’s are great for this. The general rule for working in different stitches is, the taller the stitch, the more you work in it. The taller the stitch, to make it curve into a spiral, you will need to cram each stitch full to force it to fan out and make it twist. For UK tr stitches, 5 tr’s in each stitch gives a tight spiral. The orange spiral below was created with 5 UK tr’s in each stitch back along the chain. The two spirals below are made using the same weight yarn and same hook size. They are not the same as we have used a different stitch and sequence. 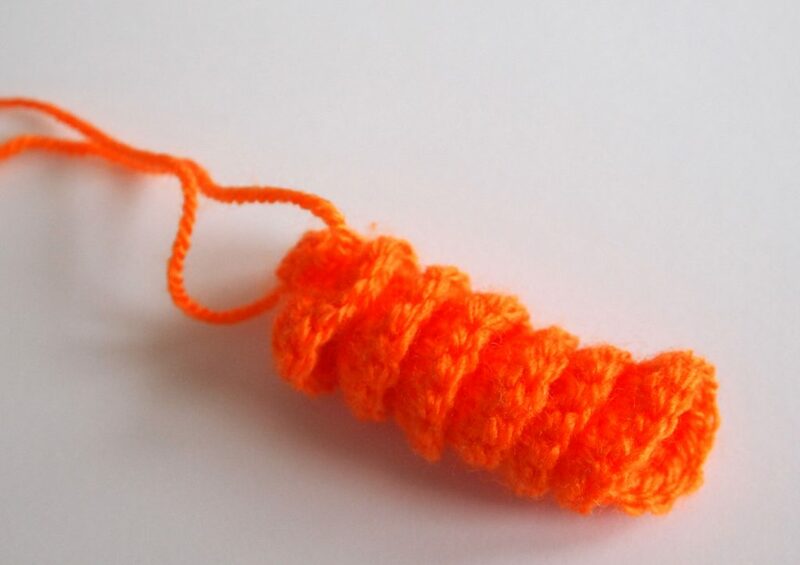 The orange spiral is UK trebles and 5 in each stitch. 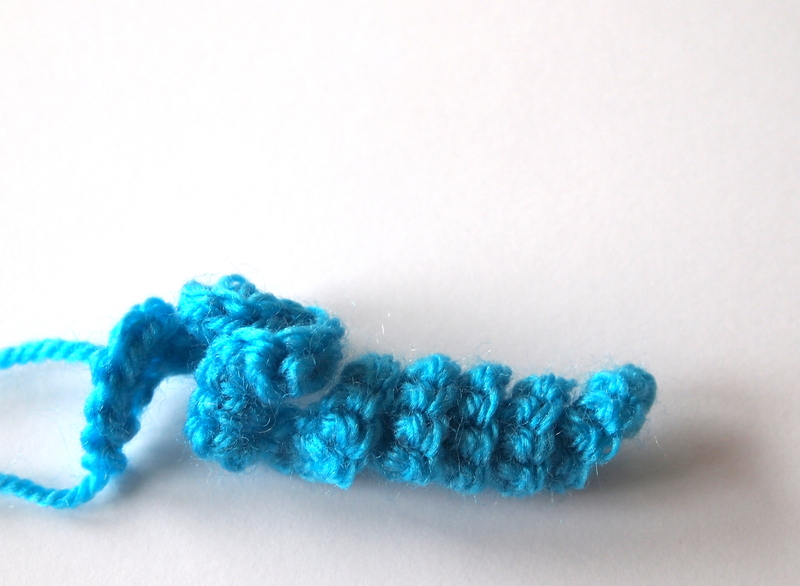 The blue spiral is UK double crochets and 3 in each stitch. The spirals below again have been worked in the same wool and hook size. 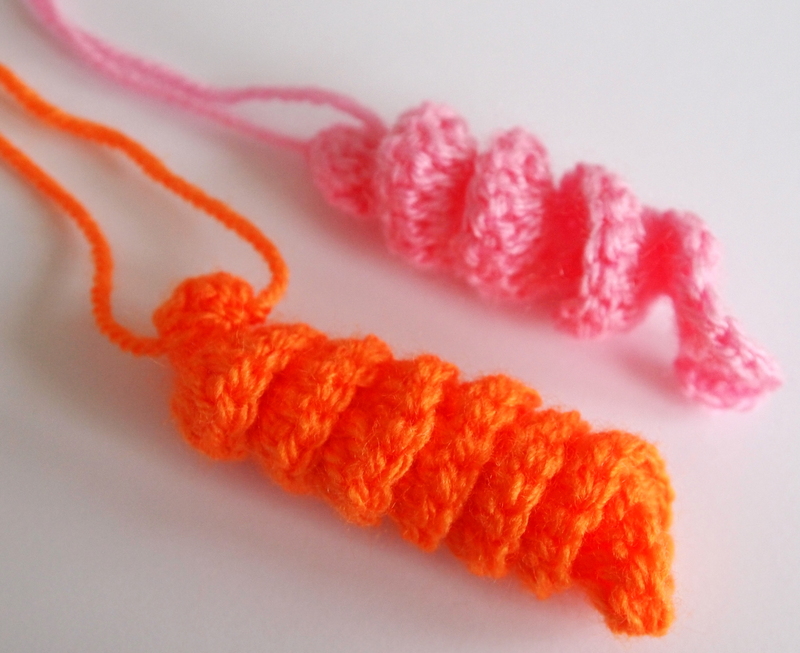 The orange spiral has been created with 5 trebles in each stitch. The pink chain only has 3 trebles in each stitch and gives a much looser spiral. They both have the same number in the initial chain. The choice really is yours as to how you want your finished spiral to look. Just have a play around with different sequences. These are a perfect way to use up all your oddments of wool. 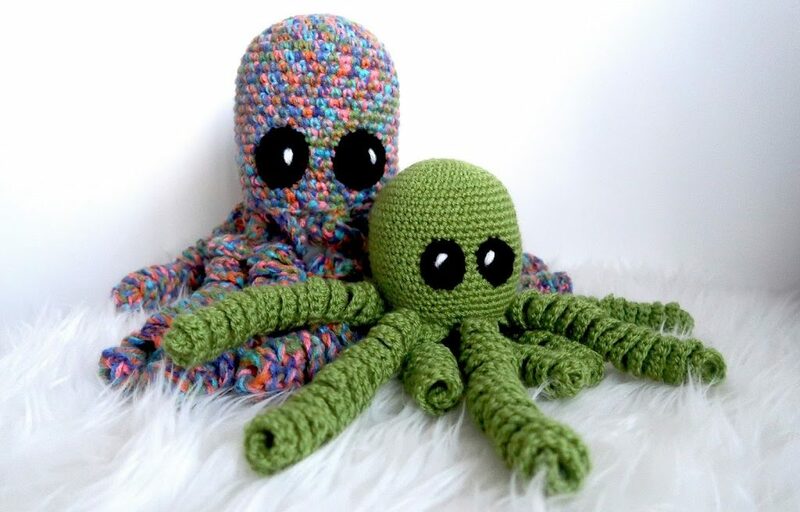 This cute little octopus is made of one colour, and would look great with rainbow coloured legs. It would make a fab colour teaching aid. This particular pattern is great for beginners and works up really quick. You can even supersize it like we did with the multi-coloured octopus, using double strands and a larger hook.